Inspiration works in strange ways. One artist inspires another, who inspire others. 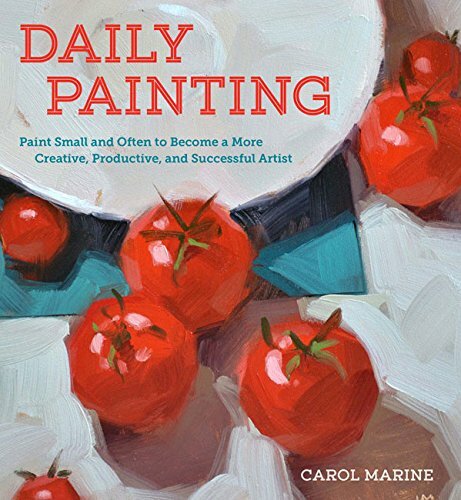 In Daily Painting, author and artist Carol Marine talks about how she was inspired by Duane Keiser who's another daily painter. So since 2006, Marine has been painting daily, and selling her work online. Marine talks about her experience on painting daily, where she finds inspiration and subjects to draw, techniques involved and how you can sell your paintings online. It's very inspiring and insightful. It certainly gives me the if-she-can-do-it-so-can-I feeling. Actually the book covers more technical topics. Here are the contents. I really like the idea of painting small. Sometimes the size of a blank canvas can be intimidating. It's difficult for a small painting to match a big one in terms of impact, but it's likely to sell better because it's more affordable. All these info are mentioned in the book. It also includes a chapter on subject matter that talks about the kind of subjects that work well on a small canvas. Marine uses oil as her main medium. However her tips and techniques can often apply to other media as well except for things specific to oil, such as wiping a canvas and starting over again. Throughout the book, there are many other artists being featured with examples of their paintings, sometimes with interviews, such as in the latter chapter on dealing with artist block. All paintings featured look beautiful and inspiring. The best part about the book is it shows you the possibility of selling your work online. It's a model that works for Marine and other painters. I've went ahead and check out the listing of other artists and her paintings on eBay and some other websites and can see people buying at the listed price. It's great to see other artists make a living using this method and it's something that anyone can get into. It's certainly very motivating. This is a great book for all artists. Highly recommended.